We understand the value of the resources under our feet and the hard work invested in obtaining them. We’re not people to put up with unfair prices and waste resources. So, why are we literally letting tons of natural gas float away? In 2015, the state calculated that 112,100 tons of methane from unconventional (hydrofracked) wells went to waste, unused due to leakages in our gas wells. And that’s on the low side; an outside estimate suggested we may in fact be losing five times as much. 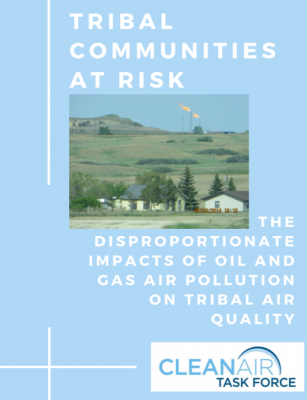 A new analysis from public data shows that Native American communities often face disproportionate health impacts from air pollution from the oil and gas industry. Meanwhile, Interior Secretary Ryan Zinke and EPA Administrator Scott Pruitt are seeking to eliminate federal rules designed to limit waste and air pollution from this industry on tribal lands. The Christian Post Op-ed: Will Trump Listen to Americans Instead of Fossil Fuel Friends? The Interior Department is currently reviewing comments on its proposed plan to dismantle a standard that would limit methane leaks and flaring from petroleum and natural gas wells on Federal land managed by the Bureau of Land Management (BLM). In the past few weeks that open comments have been accepted, almost 45,000 pro-life Christians submitted 10% of the total comments received, all of them telling Secretary Zinke and the Trump Administration to preserve the rule. As a child, I was concerned about pollution and how we care for God’s creation. Now, as CEO of United Methodist Women, I am part of an 800,000-member organization that has worked to care for creation for decades and for the welfare of women, children and youth for almost 150 years. As women of faith, we believe we have a responsibility to be good stewards of God’s creation. Helping to stem climate change is a priority for us because of this charge to care for creation and because women, children and young people in vulnerable communities are the hardest hit by the impact of greenhouse gases in the earth’s atmosphere. About one year ago, the Republican-controlled U.S. Senate voted to uphold common-sense standards that reduce methane waste, which not only protect public health but provide much needed local revenue to western communities. Now, a year later, Interior Secretary Ryan Zinke and the whole Trump administration are still disregarding the public’s will and are continuing to try and sell off rural America’s public health and economic potential to special interests by gutting the Bureau of Land Management (BLM) methane waste rule. Almost 45,000 pro-life Christians have submitted comments to Interior Secretary Ryan Zinke not to weaken methane pollution standards on Bureau of Land Management (BLM) lands. Why have we become involved? It’s simple: we want to protect the unborn, who are disproportionately impacted by the pollution Secretary Zinke’s actions will increase if he moves forward with his plan. A year ago this week, we experienced one of the only true victories for taxpayers and clean air of the Trump administration. In its rush to repeal regulations from the Obama administration, Congress sought to utilize the Congressional Review Act to overturn the Bureau of Land Management’s Methane and Waste Prevention Rule, which was designed to prevent leaks and collect royalties on wasted methane gas from federal lands. After easily passing in the House, the Senate was on the verge of approving it, as well, when in a moment of tremendous leadership, Sens. Susan Collins (R-Maine), Lindsey Graham (R-S.C.) and John McCain (R-Ariz.) bucked their colleagues and joined every Democratic senator in opposing the efforts of special interests to gut the rule. The oil and gas industry dumps 9 million tons of methane and toxic pollutants like benzene into our air each year. Methane is a greenhouse gas 87 times more potent than carbon dioxide at driving climate change and the oil and gas industry is now the largest source of methane pollution in the U.S. But methane is just one harmful air pollutant from the oil and gas industry. 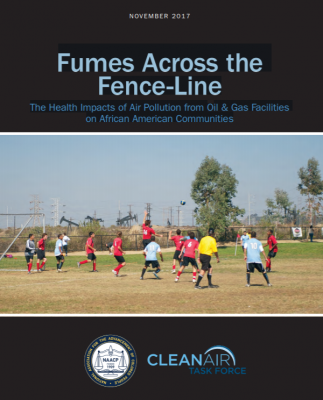 This paper sheds light on the health impacts of air pollutants from oil and gas facilities that specifically threaten the health of African American communities living near oil and gas facilities and in areas far from oil and gas production.